Mr. Toad’s Wild Ride has been gone from the Magic Kingdom for just over twelve years, but the motormania inflicted amphibian still has a place in the hearts of many guests. 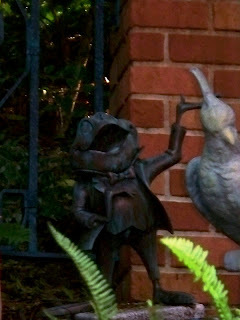 As it turns out, many of the minds behind the attractions and scene setting in Walt Disney World also remember Mr. Toad fondly. 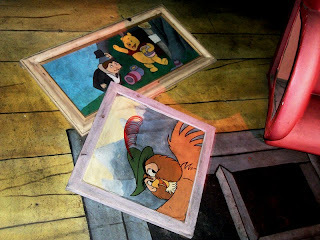 In September of 1998 Mr. Toad’s Wild Ride took its last spin down its fraternal tracks, under protest, in order to make way for The Many Adventures of Winnie the Pooh. While Mr. Toad can still be seen through rereleases of 1949’s The Wind in the Willows, his place in theme park history is well remembered by those who took a joyride with the obsessed J. Thaddeus Toad. The former residence of Toad Hall, at the corner of Fantasyland leading off towards Tomorrowland, is now the home of the gang from the Hundred Acre Wood. Respecting the previous occupants, there are two photographs strewn about Owl’s toppling treehouse that contain a crossover of the two stories. In one, Winnie the Pooh stands alongside a bowing Moley in a sign of camaraderie. In another, Mr. Toad himself appears in a portrait where he hands his deed over to Owl, a deed that has caused the amphibian quite a bit of trouble in the past, though I am sure Owl will take better care of the lot than the weasels. While a bit of a journey away from his Fantasyland home, Mr. Toad can be found elsewhere within the Magic Kingdom. Down the lane, near a home that looks to be from the Hudson River Valley, but seemingly has no occupants. Visible just before entering, or after having experienced, the Haunted Mansion is an enclosed pet burial ground featuring all manner of pets. Buried towards the back of the cemetery, peeking out from a small clump of trees, is a figure of the beloved J. Thaddeus. Mr. Toad’s Wild Ride is, without a doubt, a conflict-ridden attraction. Many would love to see it return and commiserate over its departure, while others believe the effects of the experience were lacking and its replacements serves the Magic Kingdom well. No matter the opinions, it is a wonderful treat to still be able to catch a glimpse of this truly distinctive character, Mr. Toad.